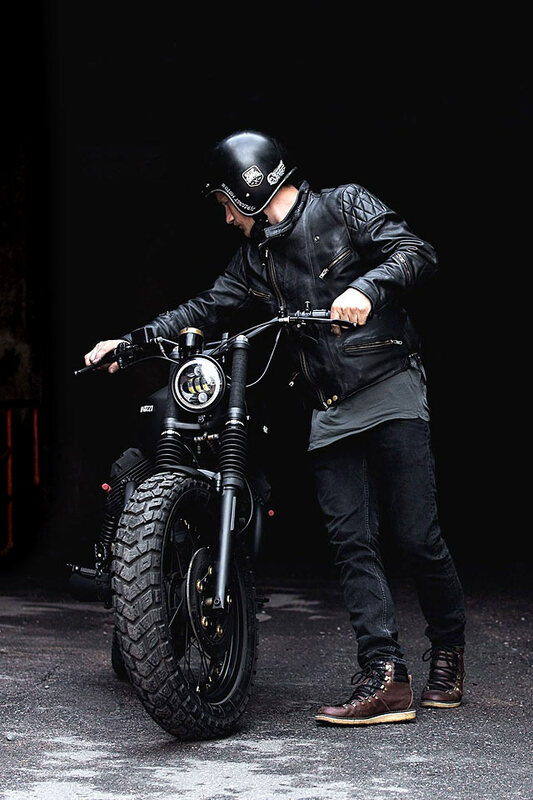 Based in the Belarus capital of Minsk, the Recast Moto workshop was founded in 2015 for the express purpose of building motorcycles based on classic ideals, designs and models. 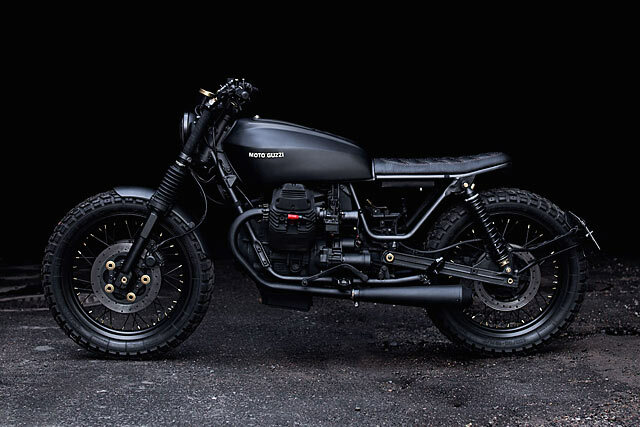 For this particular project, the Recast Moto team led by shop owner Matiz Lemark, tapped a rather clapped out ‘99 Moto Guzzi Nevada 750 on the shoulder and got to work. 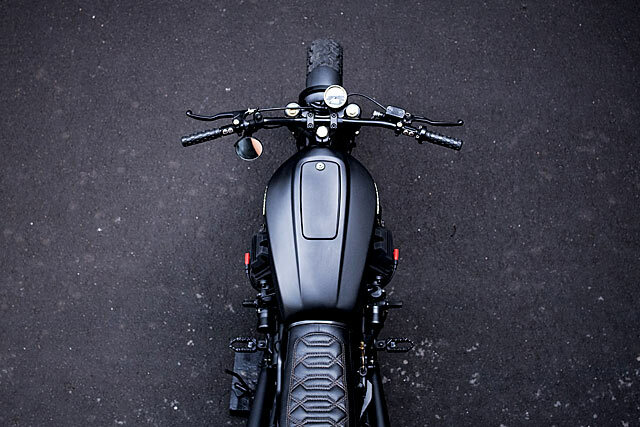 “The bike was selected to be turned into a classic-style scrambler; very brutal, very black and very male”, says Matiz. “Not too powerful but not weak, either. 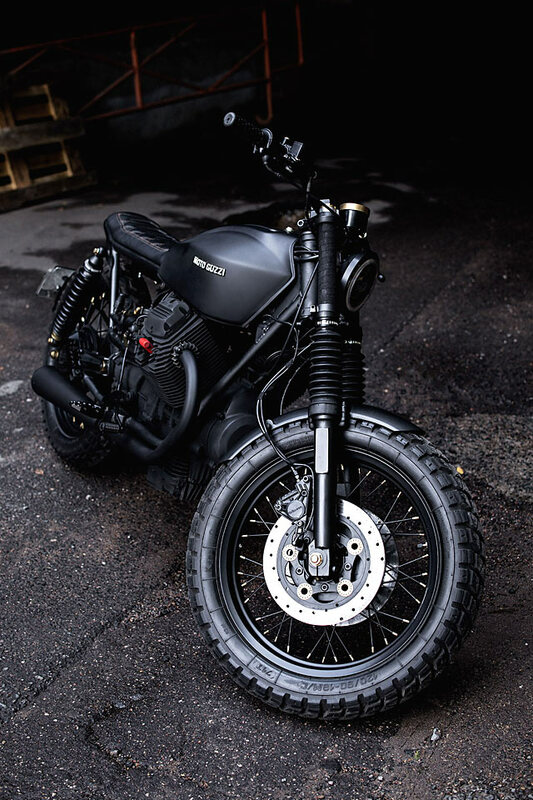 The choice came down to and old BMW R100 or an old Italian Moto Guzzi. 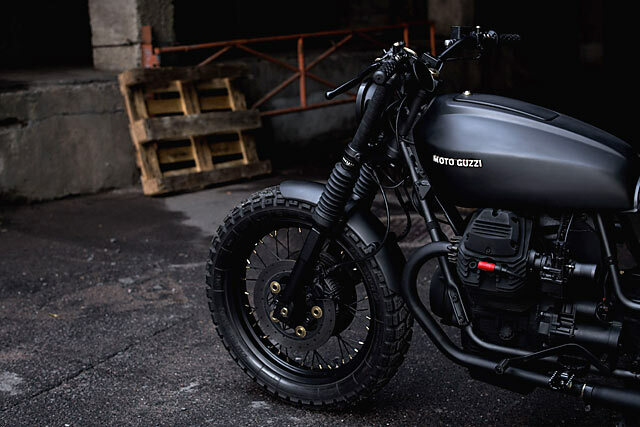 In Belarus, such motorcycles are a rarity; in fact many people have not even heard of the Moto Guzzi brand. 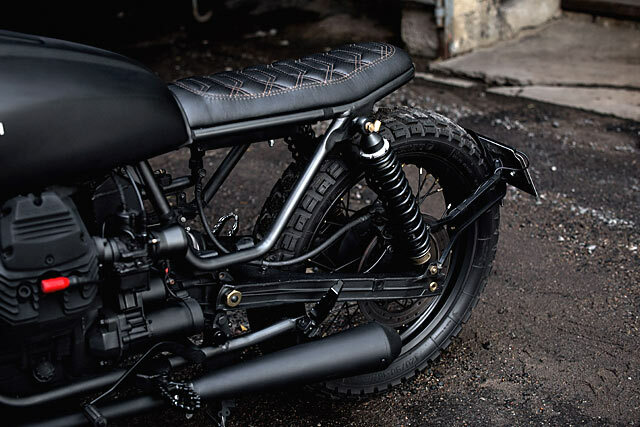 But the real inspiration came after looking at the work of Italian shop, Venier Customs. 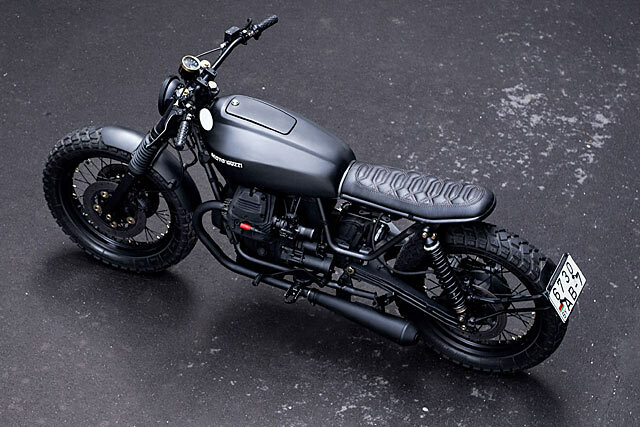 Their Moto Guzzi ‘Traktor 2’ was great inspiration for what we wanted to do”. Then they sourced a Nevada 750 club-style chopper from South West Poland. It’s classic straight frame and the low-cost was a perfect fit for the project. The customer travelled the 1400 kilometres there and back himself and soon the bike was back in the Minsk workshop. “The bike was in pretty bad condition. It had stood for a long time judging by the cracked rubber, the rust and the cobwebs on the spokes. The left hand cylinder of the engine had a few minor issues, but we were able to start it by putting in a new battery”. With winter rapidly approaching, the team had chosen the best time of year to disassemble the bike and get things sorted for spring riding. But boy, did they have their work cut out for them. 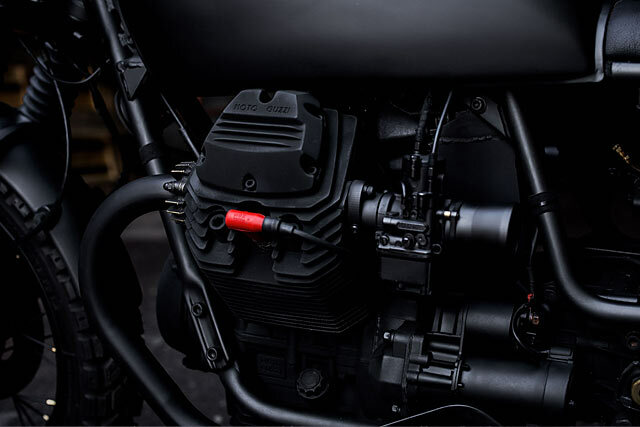 The most important and complicated element of the project was the Guzzi’s gas tank. 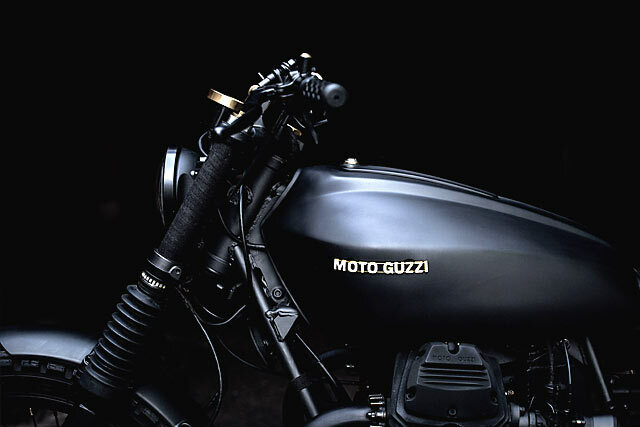 “I’d had the particular tank shape in my head for a long time; it had to emphasise the Moto Guzzi’s lines and at the same time be unique, simple and graceful. In the end I chose a gas tank from a Honda CB750. I ordered it from the US and it took about a month to arrive. So while it was on its way, I began on the wheels and the engine. The wheels got new 18″ spoked rims and some Heidenau K60 120/90s, which were ideally suited for the style of the project”. The frame was then de-tabbed and the rear section was modified so that the shocks could be mounted. The customer had requested that the bike should have straight tailpipes and a set of footrests for the passenger, so the frame was modified with fasteners for rear foot pegs from a V35 Guzzi. Up front, the shocks were left original, but they had to be shortened by 4 inches to get the bike’s stance just right. “The position of the carburettors was changed, requiring new mounts and velocity stacks. 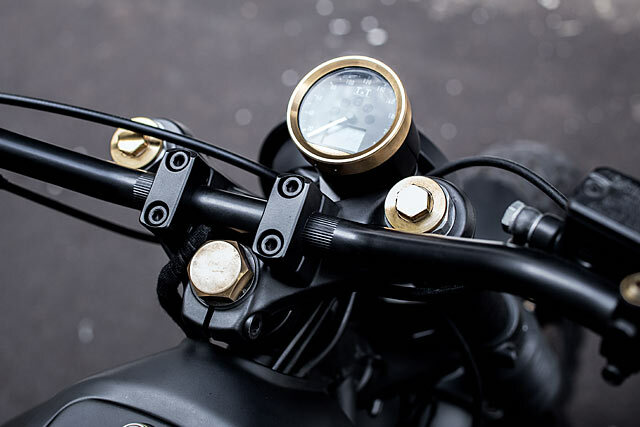 A T&T speedometer was added and then modified with some brass, along with the mounting bolts for the shocks, the velocity stack mesh, the plugs for the front damper, the mirrors and a few other smaller items”. 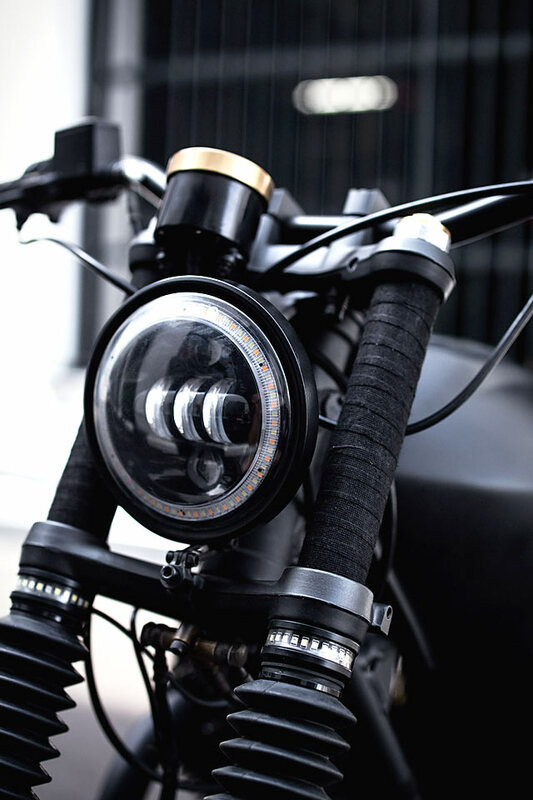 “The grips are off a snowmobile, and their distinctive honeycomb pattern was also used on the seat’s stitching”. The bar buttons are made from a unique polymer-coated duralumin (an aluminium-copper alloy originally used in WWI aviation) and should wear out sometime after 2495. 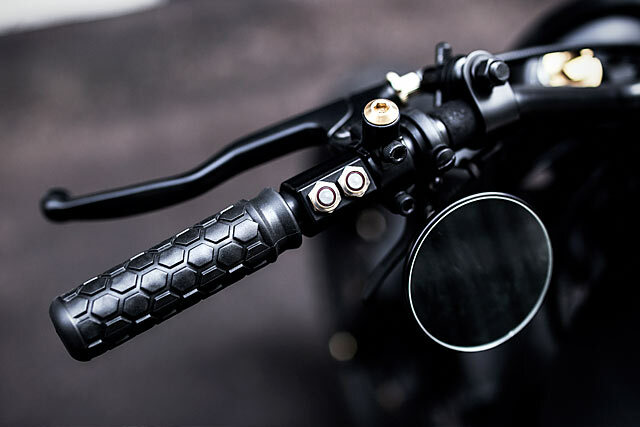 The grips are off a snowmobile, and their distinctive honeycomb pattern was also used on the seat’s stitching. “The gas tank was in fairly good condition, with just a few dents and some rust inside. Putting it on the frame to gauge how it would look, I realised that it was too big. To make it work I would have to change its whole geometry, especially the lower part. It was a really major job, but it justified all the costs and it turned out pretty well if you ask us”. After painting it got a bunch of smaller finishing touches and a fresh Moto Guzzi logo to really finish it off. “Most of all I like the tank”, says Matiz. 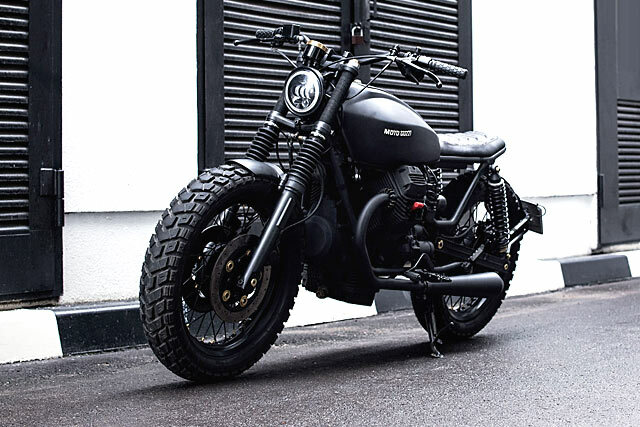 “It’s a bit like the new tank on the Moto Guzzi V9 Bobber’, he notes. Some would say that it was probably a coincidence. We prefer to think that it was more likely some animalistic, collective subconscious thing.